Artist Linda Wadley from Jasper East, Alberta, lived at the base of Folding Mountain in the eastern slopes of the Rocky Mountains. She and her new husband have moved to Vernon, British Columbia to be closer to her family and grandsons. The past five years in Vernon have been busy ones with the renovations of an older home and its garden - this is where her creative energies have been focused. The home and art studio are now finished. Once again it is time for her to be painting the landscape, this time it will be to capture the beautiful Okanagan Valley lakes, forests and mountains in her expressive and colourful alla prima style. Originally from Elk Point, Linda is Alberta born and bred. 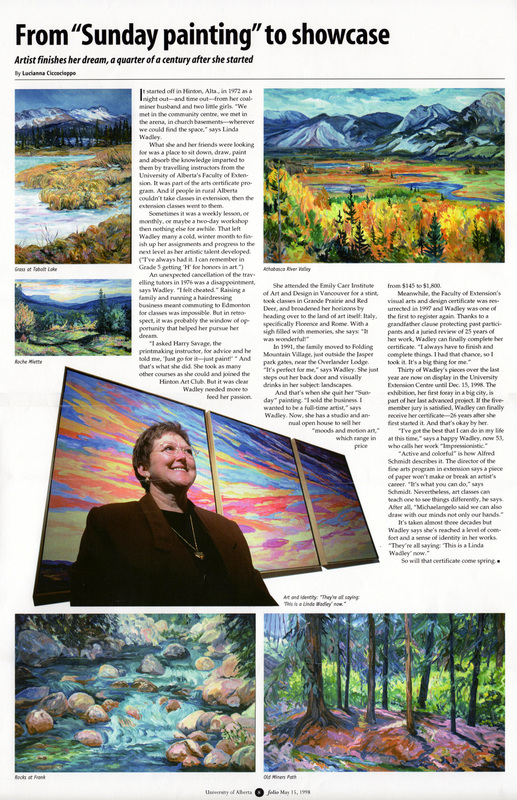 While she is an accomplished painter of portraits and abstracts, Linda’s love of the Alberta landscape, especially the Rocky Mountains, is apparent in most of her work. Her admiration for the work of The Group Seven and that of Van Gogh is also frequently reflected in Linda’s art. From 1972 to the present, Linda has taken a wide range of art courses from a variety of respected institutions including the University of Alberta Faculty of Extension, Red Deer Art College, Emily Carr College of Art and Design, and Grand Prairie Regional College. In addition, she has attended a number of art conferences, seminars, art history, and art workshops all of which accumulated in 1999 into a Fine Art Certificate in Drawing and Painting, from the University of Alberta. Linda was the first Alberta Artist to receive this prestigious award. Linda’s work has been entered in numerous competitions, many of them taking top places. Twice, she has been awarded the Constance McFarland Art Scholarship from the University of Alberta Faculty of Extension in Fine Arts (1982 & 1994), the Martha Houston Award (1996) and Lillian Nunn Scholarship Award (1996 & 1998). Linda’s paintings have been represented in galleries and exhibitions including Jasper, Hinton, Edson, Edmonton, Red Deer, Calgary and Vancouver and she has had numerous articles written about her artwork and accomplishments. The artwork of Linda Wadley is represented by a large number of privately commissioned works as well as permanent collections. Collectors own her paintings all across Canada and around the world. She states that she paints plein-air, with oils on canvas to capture the essence of the day. Learn more about Moods & Motions Art Studio and more about Linda.